Timothy John "Tim" Keefe (January 1, 1857 – April 23, 1933), nicknamed "Smiling Tim" and "Sir Timothy", was an American Major League Baseball pitcher. He was one of the most dominating pitchers of the 19th century and posted impressive statistics in one category or another for almost every season he pitched. He was elected to the Baseball Hall of Fame in 1964. Keefe's career spanned much of baseball's formative stages. His first season was the last in which pitchers threw from 45 feet, so for most of his career he pitched from 50 feet. His final season was the first season in which pitchers hurled from the modern distance of 60 feet, 6 inches. Keefe was born on January 1, 1857 in Cambridge, Massachusetts. His father Patrick was an Irish immigrant. When Tim Keefe was a child, Patrick served in the Union Army during the American Civil War. Patrick was a prisoner of war for several years. All four of Patrick's brothers were killed in the war; Tim had been named after two of them. Tim's brother became a major and fought in the Spanish–American War. After the war, Patrick had high expectations for his son, and the two frequently fought over Tim's pursuit of baseball. With the help of local former pitcher Tommy Bond, Keefe persisted and became known as a standout local pitcher by 1876. Keefe's early professional career included minor league stints in Lewiston, Clinton, New Bedford, Utica and Albany. 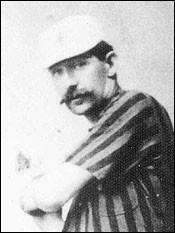 Keefe entered the major leagues in 1880 with the Troy Trojans. He immediately established himself as a talented pitcher, posting an astounding 0.86 ERA in 105 innings pitched, a record that still stands. (He also posted the best Adjusted ERA+ in baseball history in 1880.) Despite the sterling ERA, he managed but a 6–6 record, pitching in 12 games, all complete games. In 1883, after the Trojans folded, Keefe rose to stardom with the New York Metropolitans of the American Association under manager "Gentleman" Jim Mutrie and had one of the most dominating seasons in baseball's early history. On July 4 of that year, Keefe pitched both ends of a doubleheader against Columbus, winning the first game with a one-hitter; the second a two-hit gem. He went 41–27 over 619 innings pitched with a 2.41 ERA and 361 strikeouts. His 1884 campaign was almost as dominant, winning 37 games, losing 17, and striking out 334. In 1885, John B. Day, who owned the Metropolitans and the New York Giants of the National League, moved Keefe and Mutrie to the Giants. Here, Keefe joined future Hall of Famers Buck Ewing, Monte Ward, Roger Connor, Mickey Welch, and "Orator" Jim O'Rourke to form an outstanding team that finished with a fine 85–27 record. Keefe went 32–13 with a 1.58 ERA and 227 strikeouts. In 1887, Keefe sat out several weeks of the season after he struck a batter in the head with a pitch; he was said to have suffered a nervous breakdown. He had arguably his greatest season in 1888, when he led the league with a 35–12 record, 1.74 ERA and 335 strikeouts (see triple crown). He won 19 consecutive games that season, a record that stood for 24 years. The Giants played the St. Louis Browns of the American Association in a postseason series for the Dauvray Cup, and Keefe added four more wins to his tally. Keefe even designed the famous all-black "funeral" uniforms the Giants wore that season. ^ a b Fleitz, David (2009). The Irish in Baseball: An Early History. McFarland. p. 34. ^ Stevens, David (1998). Baseball's Radical for All Seasons: A Biography of John Montgomery Ward. ^ "Old-Time Star of Big League Taken by Death". The Evening Independent. April 24, 1933. Retrieved September 6, 2013. ^ Purdy, Dennis (2006). The Team by Team Encyclopedia of Major League Baseball. ^ a b c Bevis, Charlie. "Tim Keefe". ^ Roer, Mike (2005). Orator O'Rourke: The Life of a Baseball Radical. McFarland. pp. 159–161. ^ "He Won't Be Missed". The Morning Herald. March 1, 1891. Retrieved September 6, 2013. ^ """Grimes and 6 Others Join Baseball's "Hall.
' * ' denotes stats that were not officially recognized during parts or all of his career, and are incomplete. Official career statistics as recognized by Baseball-Reference. Keefe was inducted into the Baseball Hall of Fame in 1964 after being elected by the Veterans Committee. Six players were inducted that year and Keefe was one of five who had been voted in by the Veterans Committee. Late in his playing career, Keefe began to coach college baseball and he continued in this capacity after his retirement as a player. Beginning in the spring of 1893, Keefe began to work as a pitching coach for Harvard. Keefe also worked as an umpire and was involved in real estate. He died in his hometown of Cambridge, Massachusetts at the age of 76. Keefe was nicknamed "Sir Timothy" because of his gentlemanly behavior on and off the field. Keefe moved to the Philadelphia Phillies after his release from the Giants. He retired after the 1893 season with 342 wins (10th all time), a 2.62 ERA, and 2562 strikeouts. His 2562 strikeouts were a major league record at the time of his retirement. He was also the first pitcher to achieve three 300-plus strikeout seasons, done during his dominating prime in the 1880s in which he won the most games of the decade with 291. Interestingly, he still holds the record for having a win in the most ballparks, 47. 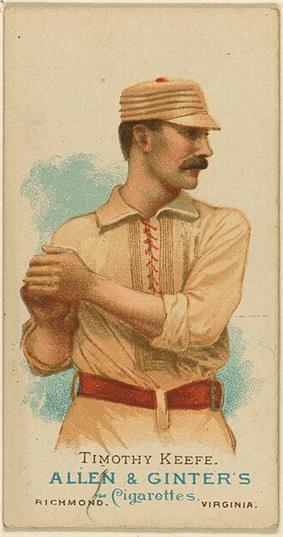 During the 1891 season, Keefe was released by New York. He was drawing a high salary and was not meeting the expectations of the team's leadership. After his release, Keefe said, "I hate to leave New York, am very fond of it, and would do all in my power for New York, but what am I to do? I have been systematically done by the New York Baseball Club... They would not let me play, and when I did get a chance, I worked under a disadvantage. I feel that I am just as good a player as I ever was." In the 1891 preseason, Keefe refused a salary offer of $3,000 from New York; he had earned $4,500 in the previous season. Keefe said, "I want to play in New York, but I never will for a $3,000 salary... To tell you the truth, however, I do not think I am wanted in the New York team, and this cutting method is being pursued to keep me out." Keefe ultimately signed with the team for a $3,500 salary. Shortly before the Players League was founded, Keefe had started a sporting goods business in New York with former W. H. Becannon, a former employee of baseball owner and sporting goods entrepreneur Albert Spalding. Keefe and Becannon manufactured the Keefe ball, the official baseball of the league. Spalding and the other NL owners fought against the new league, employing legal and financial maneuvers (such as slashing NL ticket prices) that made competition difficult. The Players League folded after one season.